What exactly are CubeSat’s and what role do they play in space exploration? Read on to learn more about these popular space explorers. CubeSats are a class of research spacecraft called nanosatellites. Their original design idea started in 1999 when CalPoly and Standford wanted a way to research low Earth orbit. Most of the CubeSats launched by 2013 were by universities for their STEM programs. They served to provide Earth observation or amateur radio communication. Furthermore, these tiny satellites were often precursors for large spacecraft technologies. Instead of building a large scale test model, the smaller models kept costs low. 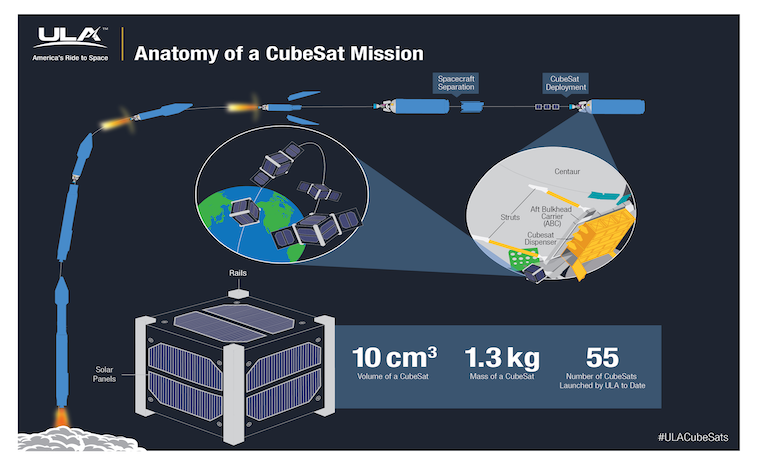 The cube-shaped satellites are spacecraft with sizes called units. These units or U’s, start at 1 U and can get to about 12 U. A unit is defined as a volume of about 10 cm x 10 cm x 10 cm. It typically weighs less than 1.33 kg or about 3 lbs. The early CubeSats were 1 U or sometimes 3 U. A 3 U means that three units were stacked together. Today, commercial companies have launched 6 U and 12 U CubeSats into space. CubeSats reduce launch costs in two fundamental ways. They don’t weigh that much, which means a rocket doesn’t need a lot of fuel to bring them along. Furthermore, they can share a rocket with a larger satellite. However, they have some design challenges. As a tiny box of electronics, it has more sensitivity to radiation. Design engineers build them to last a few weeks, but increasingly, they have them lasting months or even years. The low Earth orbit ones often fall back into Earth’s atmosphere. Again, this is by design to keep costs low. Each year new technologies allow companies in the private sector to use CubeSats. National Public Radio has shown interest in using them for satellite radio. To get into space, CubeSats have to hitch a ride, and companies like Virgin Galactic, Firefly Space Systems, and Rocket Lab have orders to provide rockets. With more and more schools and companies making CubeSats the demand for getting them into space will increase. Incidentally, many of these small units have been deployed by the International Space Station. One astronaut even launched one by more or less throwing it off the ISS. According to nanosats.edu, more than 2100 CubeSats and nanosatellites have come into existence. In 2018, two CubeSats, MarCo-A and MarCo-B, also known as Wall-E and Eve, launched alongside NASA’s InSight rover to monitor its landing Mars. This $18 million dollar project sent the CubeSats out beyond Earth’s orbit. Their mission was to test communication and navigation technology. As a result, eight minutes after landing NASA knew that InSight landed safely. The CubeSats quickly provided information using radio waves. They also provided an image from InSight on the Martian surface. In addition, to tracking InSight, NASA tested the CubeSat’s endurance and navigation abilities in deep space. In 2017, The ESA planned to award funding for CubeSat technology to study the moon. As with every new endeavor, the ability to learn more about our solar system creates new possibilities. CubeSats certainly look like they will lead the way in the exploration of the solar system.